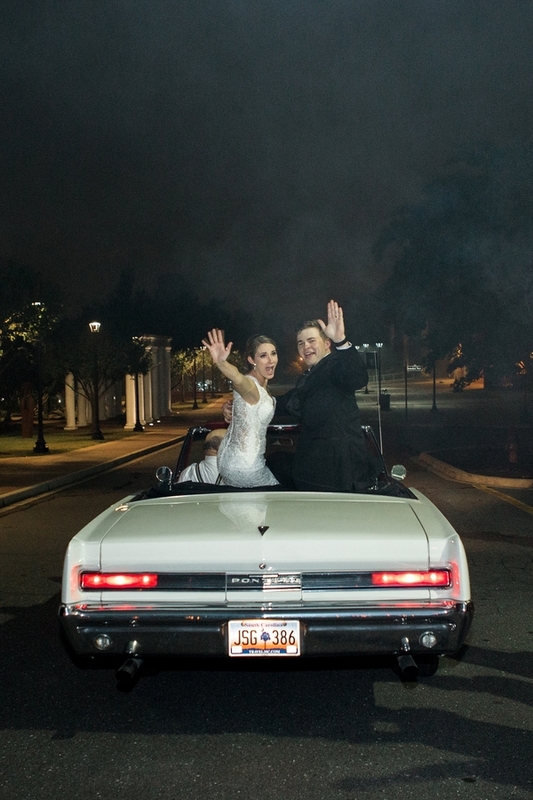 One devoted couple, 400 guests, a vintage getaway car, and plenty of monograms: it's a perfect recipe for this beautiful Winthrop University wedding! 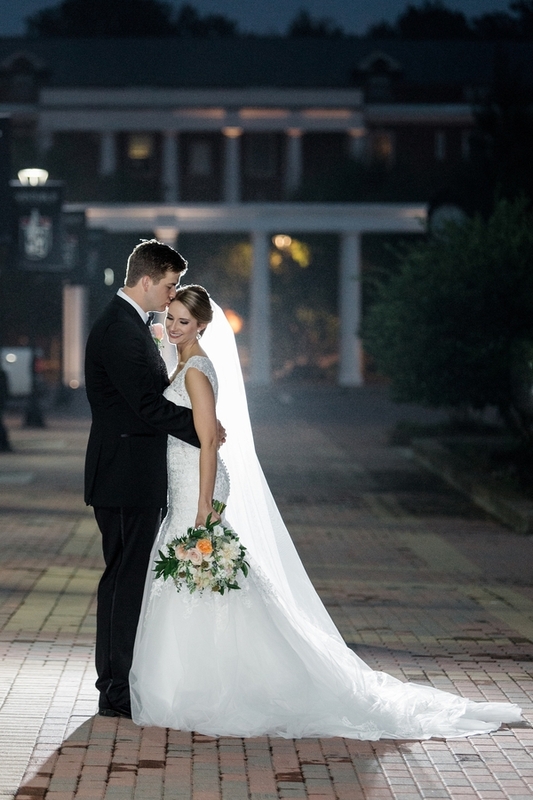 Morgan and Luke celebrated nearly a decade being together when they tied the knot in Rock Hill, South Carolina, last year in a large wedding that made every one of their guests feel included despite the size. Aaron Reel of Aaron Reel Photography caught every moment of it all from the sweet details to the fun-loving bridal party. When you're expecting 400 guests at your wedding, the logistics of making everyone comfortable throughout the day becomes more important than ever. 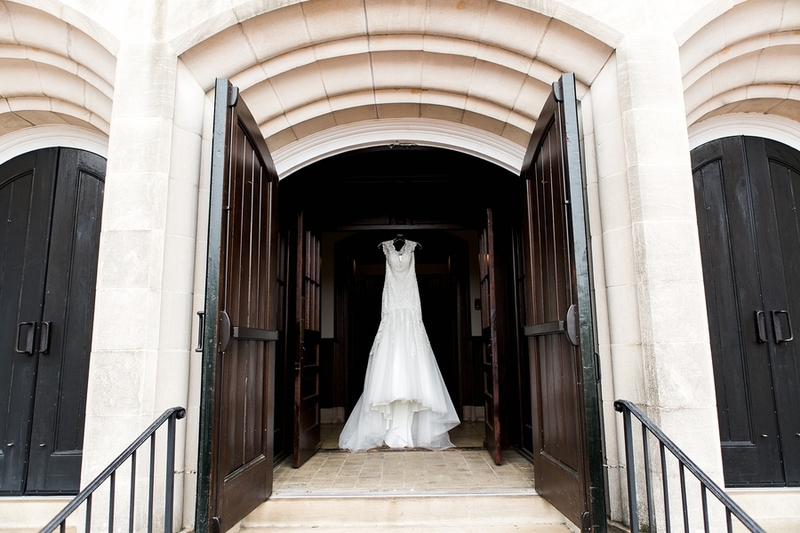 Bride Morgan says, "accommodating an event of its size was tough in a small town!" Morgan and Luke wanted to have their ceremony at their families' churches, but had to look for other event locations when they realized that their guest list would suffer otherwise. After looking at St. John's Methodist Church in Rock Hill, they knew that it would be a better way to accommodate all of their friends and family. Finding a reception hall was fairly easy: in Rock Hill, there is only one location that will hold a party of that size. 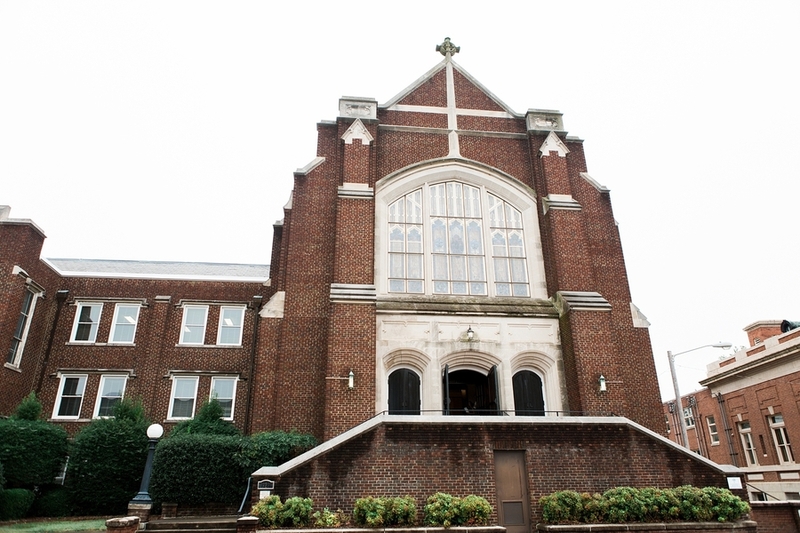 McBryde Hall on Winthrop University's campus was the obvious choice for them. And, as an added benefit, it was the same location where Morgan and Luke attended prom together in high school! Ultimately, the two locations were perfect for the couple. "We are blessed that both places were lovely and felt special to us," stated Morgan. When their wedding day rolled around, both spaces worked exactly as needed for their guests, many of whom had flown into South Carolina for the wedding. With their friends and family cheering them on, Morgan and Luke exchanged vows at the altar of St. John's in a stunning and heartfelt ceremony. After making their new life together official at the church, the newly married couple met their guests at the reception hall for a fabulous evening. Everyone was having so much fun that the getaway wasn't much of a getaway. In fact, no one left after their big goodbye, so Morgan and Luke turned around and continued the festivities with their guests into the night. Planning and executing a wedding is stressful: there are hundreds of decisions to be made, a budget that must be adhered to, invitations to send, and seating arrangements to organize. Morgan had interned for Cricket Newman, a wedding planner, while in college, and it was then that she saw the immense details that come along with a wedding. She knew that she wanted her wedding day to be relaxing and all about her family and friends instead of worrying about what could go wrong. "That is why we hired a wedding planner that decorated both of our venues, created all of our floral arrangements and broke everything down the next day," she said. She and Luke worked with Ribald Events to envision what they wanted their day to look like and the wedding planning team took it from there. Once they'd assembled a photographer, hair and makeup artists, and a caterer, their team was set, and the couple had to do nothing more than relax. The end result: a stunning event that was tailored made for them and their guests. Morgan and Luke go way back: they met in high school! They then kept their relationship strong through college despite the fact that they were attending schools in 2 different states. Morgan attended the University of South Carolina in Columbia, South Carolina, while Luke was at Emory University in Atlanta, Georgia. But those sweet times together in college were always overshadowed by the fact that they lived so far apart. When it came time for the couple to head back to their respective schools, bride Morgan recalls, "I would cry… every single time." As they said their goodbyes, Luke would always comfort Morgan by telling her that their separation was temporary and that he was always in her heart. "I'm always in your heart" became their sweet sentiment to one another, and, as a remembrance of the many times they've said it to one another, Morgan engraved the phrase inside Luke's wedding band.